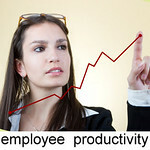 Managers often come up short when faced with increasing employee productivity. Is it even possible to control the reigns of an office that is constantly bombarded with distractions like Facebook, twitter, YouToube and the realm of social networks that skim the cream off of a company’s billable hours? Goodman UK recently surveyed 1,000 office workers to determine what makes them tick (or ticked off). Yielding interesting results, the report acts as a golden compass for determining how to improve employee productivity measurement and statistics. From the emotional stability of professionals to their preference for barrister-roasted coffee, the research suggested that employee loyalty can be won given the right environment. While micromanagement, pointing out staff mistakes publicly, avoiding project ownership, calling irrelevant meetings and ignoring top performers has rendered many a corporate leader completely ineffective, it seem that there are factors that motivate the general workforce to produce more, and stick around, when it comes down to the crunch. Work Environment: Goodman UK’s survey indicates that an overwhelming majority of professionals are very much interested in their office surroundings. They are also likely to judge a company within the first five minutes of entering the workplace. CEO’s that invest in warm, pleasant, high-tech office space have a better chance of getting the thumbs up from 63% of workers than those who don’t. Social Setting: Linked to employee productivity, workforces stated that good office humour is very important to them. With spending eight hours of their day in the same room as their work colleagues, it’s no wonder that social setting has become a major deal for corporate persons. Condiments: Coffee, a kitchen stocked with treats and affordable lunches; it’s the simple things in life that promote employee productivity. Being able to sip on a cup of the good stuff and nibble on some chocs from the pantry can highly increase the general happiness of office workers. Did you know that unhappy workers are 10% less productive than happy ones? Companies that focus on getting more for less are ultimately withholding that teaspoon of sugar that could instantly transform unhappy workers into happy ones. It needs to be a win-win situation or they’ll sniff out the cons, and won’t stick around for the pros. A daily cup of barrister coffee and a few extra heaters could be the deciding factor between whether an employee sticks around or not in the long run! In the end, employee productivity comes down to getting your staff interested in your company’s aims. Challenge them, train them – invest in their wellbeing and they’ll invest in yours. Bella Gray is a business blogger from her office space Bristol. A wealth of tips and strategies for mobilising the workplace, Gray is the perfect go-to-gal for all your corporate solutions.